Rising licensing fees are forcing Revell Inc. out of the business of producing NASCAR models, according to the Los Angeles Times. Revell, an Elk Grove Village, Ill.-based division of Hobbico, has made NASCAR models for nearly 30 years. Production of the NASCAR models will end Feb. 28, the newspaper's Jim Pelz writes. Other race cars, hot rods and street cars will still be part of the company's model lines, along with airplanes and military hardware. 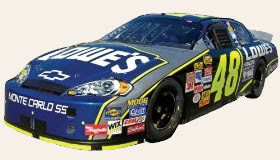 Revell pays three separate licensing fees for each NASCAR race car. One goes to the auto manufacturer, a second to NASCAR and a third to the driver/team involved. And as those licensing costs rose, profits margins were squeezed. "It was a very frustrating and very difficult decision,” said Mike Brezette, Revell’s vice president of marketing told the newspaper.